As a company, Huawei understands the importance of detail. It wants your experience with one of its products to be phenomenal from the outset, including holding and opening the box. The Mate 8 comes packaged in an elegant black box with a feel that befits the premium phone inside. It is not cheap plastic or styrofoam, but closer to the material that a high-end watch or piece or jewelry would come in. Once you open the box, the presentation is simple. The phone itself draws all the attention, as it should. Underneath the phone sit three individual boxes housing the owner's manual, power brick and headphones. Like the outside, the interior of the box is minimal, but elegant and meticulously crafted. Each Huawei device I've tested has made a significant statement with its first impression, proving that the Chinese company undoubtedly knows how to design great hardware, and how to present it. As is standard with flagship phones, the Mate 8 has a metal and glass build. Like the Nexus 6P (also a Huawei device), the Mate 8 has two strips of plastic on the rear of the phone to allow the interior antennas to properly function, but otherwise is entirely constructed of metal and glass. The fingerprint scanner is found on the back of the phone, again like the 6P, just below the camera. The camera is a 16MP shooter with an f/2.0 aperture, OIS, phase detection autofocus and dual-LED flash. There is virtually no camera bump on the Mate 8, a welcome change from most high-end smartphones. No need to worry here, there is a headphone jack. 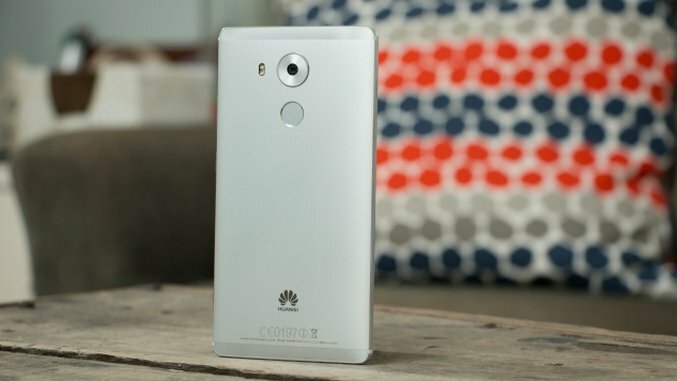 Unlike the 6P, Huawei opted to stick with Micro-USB for its flagship. Unfortunately, the speaker is located on the bottom of the phone and is nothing to get excited about. It gets decently loud, but the sound is tinny and often distorted. The one undeniably fact of the Mate 8 is that it's massive. With a 6-inch screen, the Mate 8 makes the 6P, a large phone itself, feel relatively svelte by comparison. The 6P is ever so slightly taller, but otherwise the Mate 8 is the grander phone in every dimension. The screen is only 1080P but my initial impressions are positive. It gets incredibly bright, has good viewing angles and overall is very sharp. It does seem to struggle with color, often they appear washed out, but more testing is needed before a definitive conclusion can be drawn. The phone runs Huawei's own Emotion UI which, unlike the company's hardware, is not a leader in terms of design. I was not a huge fan of the software during my time testing the Honor 5X, but perhaps I can be swayed after using it on the company's top-of-the-line offering. That's all from the Mate 8 for now, but be on the lookout for Paste's full review in the next few weeks! Huawei has quickly made a name for itself as one of the best hardware companies in the smartphone game. It broke out last year with the Nexus 6P, a phone that offered phenomenal build quality and, of course, top-notch software thanks to Google’s stock Android. Earlier this year we reviewed Huawei’s budget option, the Honor 5X, a phone that similarly offered great build quality but was ultimately let down by the company’s poor software. Enter the Mate 8, Huawei’s biggest and baddest smartphone. Can this device, with all its hardware panache, escape the fate of its cheaper brother and succeed in spite of its software? We’re ready to dig in and put the Mate 8 through its paces, but first it’s time for our hands-on impressions.